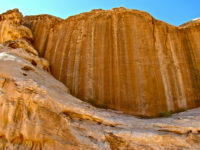 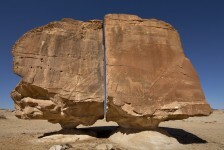 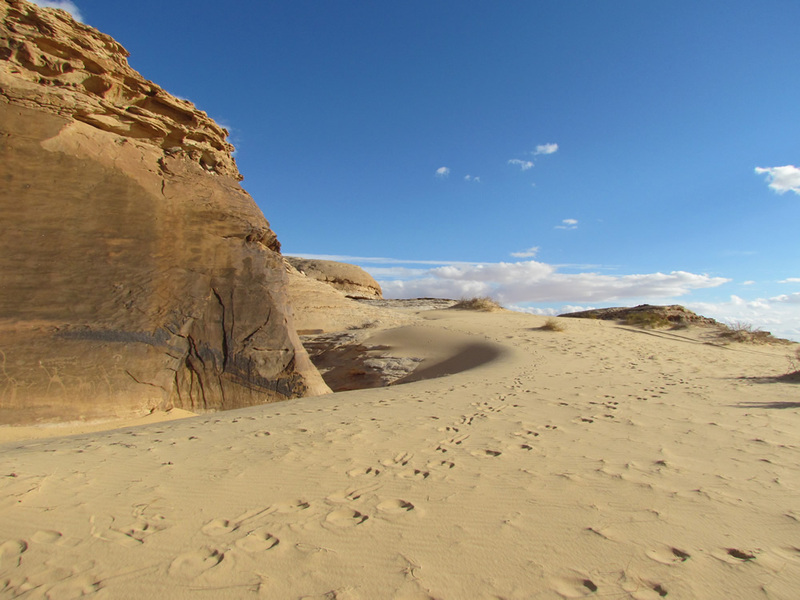 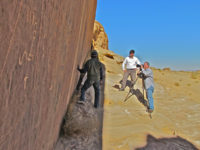 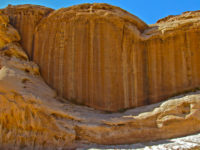 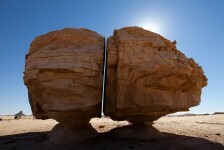 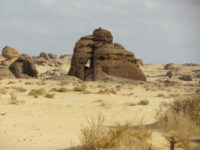 The oasis of Tayma is located in the Province of Tabuk, 220 km southeast of the city of Tabuk. 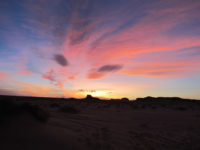 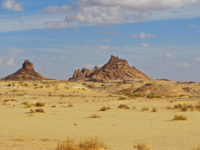 Tayma occupies a relatively flat basin on the western edge of the al Nafud desert, to the east of the Western Shield area that includes the volcanic crest known as Harrat al ‘Uwayrid. 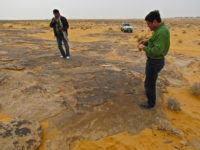 North of the settlement of Tayma is a large seasonal salt pan (sebkha), formed by a lake in the early Holocene. 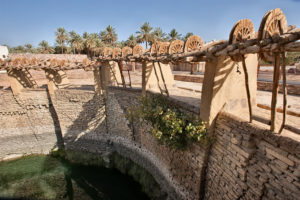 In the center of the oasis is Bir Hadaj, a well measuring 18 m diameter, surrounded by palm gardens. 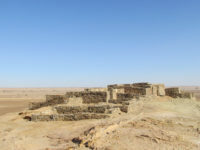 The modern town is built on top of about one-third of the ancient settlement of Tayma, which has an estimated area of some 950 hectares. 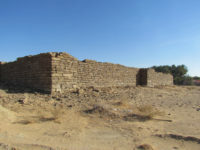 High walls stand as the most visible reminders of the ancient occupation of Tayma. 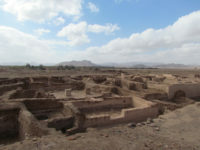 The concentration of human population at Tayma and its historic significance can be attributed to three primary reasons: the presence of the oasis and its ability to attract people and animals, its convenient location for a trade station on the incense route, and the fact that Tayma served as a residence of the Babylonian king Nabonidus in the mid-6th century BCE. 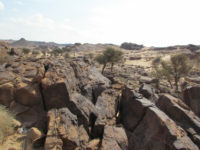 Investigations have identified archaeological remains at Tayma ranging from flint scatters representing bead production dating to the 4th millennium BCE, through Middle Bronze Age (early 2nd millennium BCE) sites, up to and including Islamic period habitation. 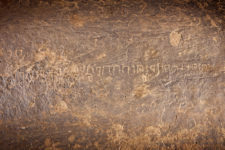 The vast array of written sources from this region are mostly Taymanitic (‘Thamudic’) and Aramaic inscriptions dating to the 1st millennium BCE. 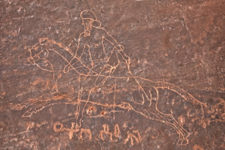 Assyrian sources attest to contacts between Arabian tribes and Assyria from the 9th century BCE. 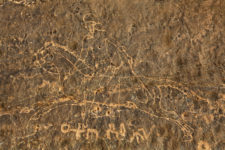 In the mid-8th century BCE, a written text found in the Middle Euphrates region mentions a caravan coming from Tayma. 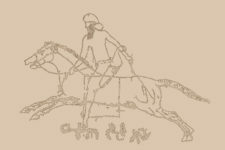 After that, it is accredited with paying tribute to the Assyrian king Tiglath-Pileser III. 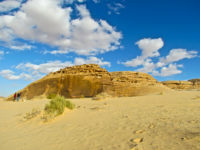 Assyrian and biblical sources identify Tayma as a trading post, and it was known to be a rival of Dedan (present day Khuraybah) for centuries. 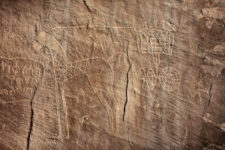 Documentation of Tayma’s relationship with the later Neo-Babylonian and Achaemenid empires is only weakly understood. 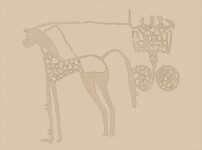 Similarly, its relationships to regional powers like the Lihyanite kingdom survive only in limited records. 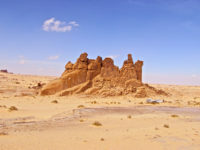 During the Minaean period (ca 400 BCE), Tayma ceded authority to Dedan. 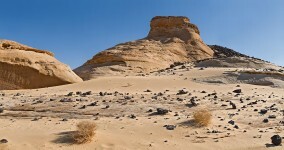 Later it was subsumed under the Nabataean and Romano-Byzantine realms. 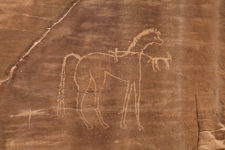 These connections with neighboring regions mean that horses, as well as chariots and cavalry, came in and exited from here certainly from at least the Iron Age onward into recent historic times. 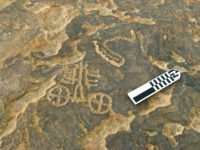 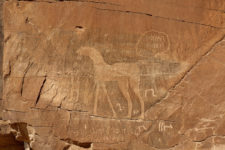 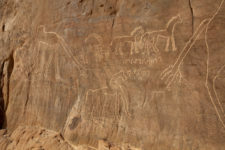 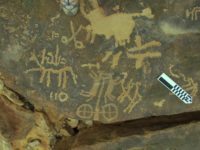 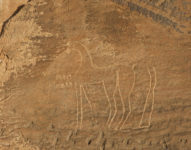 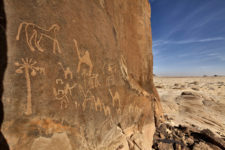 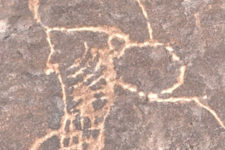 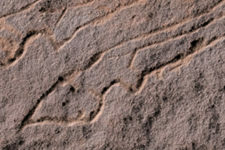 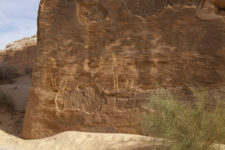 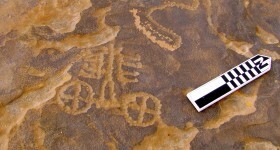 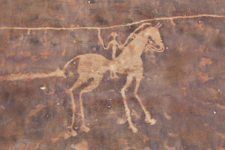 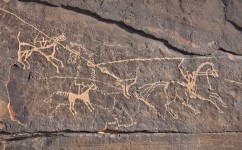 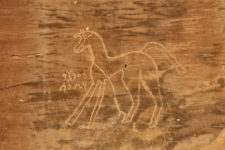 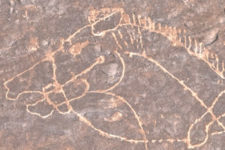 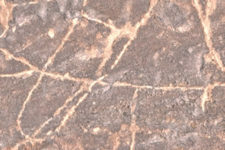 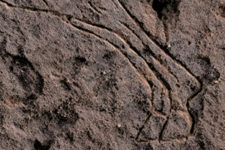 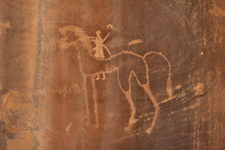 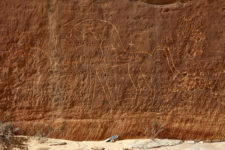 The types of chariots and the breeds of horses depicted will help shed light on both their sources and the dates of the rock art in which they are shown. Bir Haddaj, located at Tayma, is one of the most famous wells from ancient times and is an outstanding architectural landmark for the region. 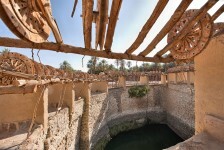 The well is known to date back at least to the middle of the 6th century BCE, during the Babel occupation. In the 5th century BCE, all of Tayma was abandoned and buried, so the well fell into disuse for many centuries until Suleiman al-Gonaim restored it to a functional state. 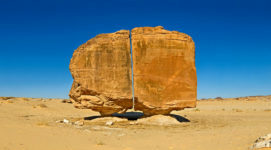 In 1373H (1953), King Saud, May Allah Bless His Soul, added four pumps to increase production and help local farmers to obtain sufficient water for their crops. 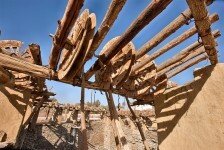 Its various parts have been repaired through the decades, and His Royal Highness Prince Fahad bin Sultan bin Saud has authentically restored it to its previous appearance.